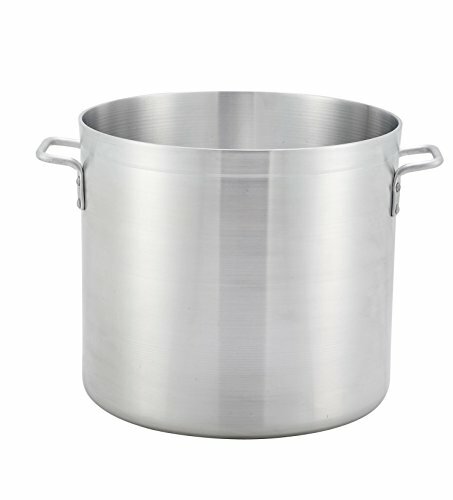 Winco ALST-100, 100-Quart 20" x 17.7" Extra Heavy-Duty Commercial Grade 3/16" Thick Aluminum Stock Pot, NSF is a versatile cookware, perfect for preparing broths, soups and stews, braising meat and vegetables, making sauces and more. The pot has wide base and high sidewalls construction providing quick and even heat distribution. It is made from premium quality 18-8 stainless steel with encapsulated sandwich bottom consisting of an aluminum core encased in two layers. Two reinforced stainless steel handles aid in easy transportation throughout your kitchen. This pot by Winco is a must-have cookware for any restaurant's kitchen plus it is NSF approved. This professional stockpot is a versatile commercial cookware, perfect for preparing broths, soups and stews, braising meat and vegetables, making sauces and more. This heavy duty pot features wide base and high sidewalls construction providing quick and even heat distribution without hot spots. It is made from premium quality 18-8 stainless steel with encapsulated sandwich bottom consisting of an aluminum core encased in two layers. Two reinforced stainless steel handles aid in easy transportation throughout your kitchen. This 100-qt sauce pot by Winco is a must-have cookware for any restaurant's kitchen plus it is NSF approved.